Raise money for OYT South! MDL Marinas has launched a new charity initiative - My MDL Selfie - challenging berth holders, marina visitors and boating enthusiasts to get snapping this summer. 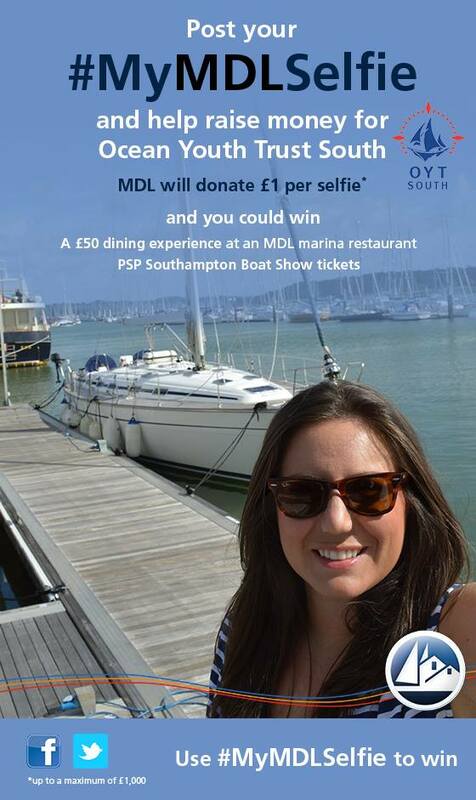 In aid of Ocean Youth Trust South, MDL Marinas has pledged to donate £1* (up to a total of £1,000) for every selfie received via social media using the hashtag #MyMDLSelfie. MDL Marinas wants to see how people are making the most of the Great British summer with a selfie photo - whether it is a snap taken during a hard day’s racing, enjoying an MDL social or simply just a day’s boating on the water or relaxing at the marina. Entrants will not only be able to contribute to Ocean Youth Trust South's charitable work - they will also be in with a chance of winning a dining experience with £50 dining vouchers up for grabs at a number of the fantastic restaurants across the MDL marina portfolio. Tickets to the PSP Southampton Boat Show will also be on offer, where winners will be able to see their selfie snap on display on the MDL Marinas stand, located at E52. MDL Marinas will select the best selfie entries based on their marina-themed settings and sense of summer fun. MDL Marinas has a long standing partnership with Ocean Youth Trust South, including the annual sponsorship of the MDL Sail Training Awards. MDL Marinas has pledged to donate £1 for every selfie received as part of this campaign, but those involved can also donate additional monies to the charity just by texting MDLS99 followed by the donation amount to 70070. If you also copy your selfie entries to webmaster1@oytsouth.org, we can post them here!